Malayalam film industry known for its realistic approach in film making has got recognition from around the world. Having its own space in history of Indian cinema, film making in Kerala has grown up to next phase. With the advent of technology, young passionate with filmy dreams could make a smooth entry both in front and behind the camera. The industry which has gone past much transition during the last few years could not make momentum in the theatres in regard to its box office performance. Considering the number of films released in 2014 till the two quarters, it would be 81 in total. For a moviegoer, the numbers might be fascinating, but while analyzing the performance of the films in the theatres the reports would keep up the heat high. 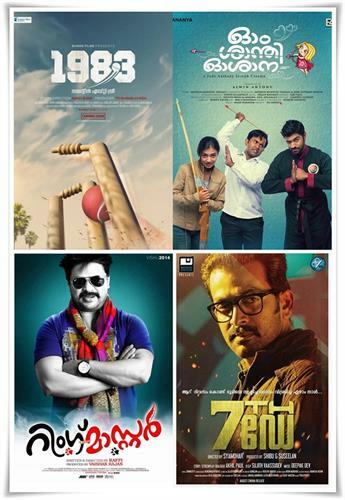 Out of 91 movies released in 2014 (81 malayalam, 10 dubbed), only 6 movies managed to get the support of the audience. While big projects with prominent actors in lead vanished for theatres within a week, a couple of movies made with limited budget got well reception at the box office. It is calculated that, the industry has made a loss of around 150 crores giving less chance for more producers to take new ventures. If sources are to believed around 50 – 70 movies made between 2013 -14 is still unboxed due to non availability of satellite rights. As the television channels unanimously decided not to entertain those films made only to gain satellite rights, many films remain untouched. So now it is time to consider those movies which could make an impact in theatres regarding its performance in the box office. The movies are arranged in order respective of their appearance in theatres. Out of 10 movies released in the month of January, only '1983' directed by popular fashion photographer could make an impression for its realistic approach in film making. The director managed to add a nostalgic touch to the film as every young viewer could closely relate to his personal life. Produced by Shamsudeen, this film revolves around cricket and memories related to 1983, the year India won the world cup. Nivin Pauly, Anoop Menon and Nikki Galrani gave life to prominent characters in the movie. Made with a limited budget, the movie completed 100 days with more than 7734 shows. '1983' could gather more than 10 crores from its 100 day runs in theatres both in Kerala and outside. Out of 13 movie released in February, 'Ohm Shanthi Oshana' directed by debutant Jude Anthany Joseph could make an impressive show in the theatres for its innovative approach and positive outlook in film making. Produced by Alvin Antony with a budget of more than 5 Crore, the movie managed to complete 110 days with 14100 plus shows. Ohm Shanthi Oshana' which featured Nivin Pauly and Nazriya Nazim in lead proved to be a box office success gaining more than 10 Crores from its total run in theatres. Out of 10 movies released in April, Dileep's Ring Master managed to entertain the ladies and children. Even though the movie received negative reviews in the initial stage, the mass audience well accepted it flocking into the theatres. Made with a budget of 8.5 Crores, the movie could gather 15 Crores while the satellite rights was bagged by Asianet for 7 crores, is sources are to be believed. 'Ring Master completed 75 days of its run with more than 12200 shows in theatres. Prithviraj's 7th Day was yet another summer release which managed to entertain the audience for its novel way of narrating the story and extra ordinary climax. Despite less promotions, '7th Day' could bring movie enthusiasts to the theatres. This crime thriller directed by Syamdhar competed 65 days of run with 7500 shows. Made with a budget of 5.5 Crores, this movie made a gross collection of Rs 9.5 Crores. The satellite rights were sold for Rs 2.5 Crores. How Old Are You which celebrated the comeback of actress Manju Warrier emerged as the most grossing women oriented movie made in malayalam. Directed by Rosshan Andrrews and produced by Listin Stephen, the movie succeeded in bringing family audience after the mega blockbuster 'Drishyam'. After 42 days of run, the movie has already screened 8500 plus shows. 'How old are you have collected 12 Crores while its satellite rights were sold for Rs 5.5 Crores. Bangalore Days counted as the first blockbuster of the year has received an overwhelming support from the young moviegoers. Written and directed by Anjali Menon, the movie which featured an young cast of Dulquer Salmaan, Fahadh Faasil, Nivin Pauly, Nazriya Nazim, Parvathy Menon, Isha Talwar and Nithya Menen is making an impressive run in theatres. 'Bangalore Days' with its 30 days of run could gather 20 crores, with good business in the rest of India markets. With a number of bug budget movies gearing up for release, the number of releases is predicted to cross 150. So get ready to enjoy the visual treats offered by the superstars and young filmmakers in the months to come. All the above mentioned films released during 2014 has created a new talented and hopeful era for malayalam film industry. Among them 'Bangalore days' has created history collection during its initial period. 'Seventh day' was prithvi raj's one of the top suspense thriller. 'Ohm santhi hoshana' was a romantic new generation film. The talent of dileep to make people laugh in the film 'Ring Masters' has brought this film to its success.